Imagine two boys running toward you and grabbing books out of your hands so quickly that you can’t even look at them. That is exactly what happened when a surprise package arrived from Sterling Children’s Books. NHL and JSL saw the titles on two of the items and snatched them from my hands and ran off to read them together. It made this parent and teacher so happy to see the kids eager about reading. They were laughing, learning, questioning each other, and asking for more. What books am I referring to? Deciding which one of three statements is outrageously false is the challenge you face in each round of Fact or Fib? After you’re made your choices, you’ll turn the page to find out the answers and get more interesting information about each topic. Kids (and adults too!) 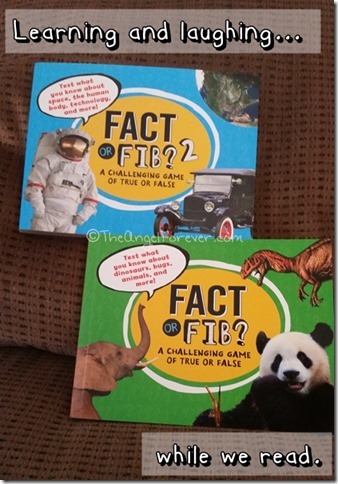 will enjoy playing Fact or Fib?rainy days, during recess, and at parties-it can be playing anytime, with anyone! As I mentioned, my boys were hooked with the books and spent hours across many days checking out these books. I truly did have to pry them away to check them out for myself. It was interesting to see the mix of science information presented in a small powerhouse of a book. The pictures on all of the pages are likely what kept my first grader intrigued, but the content alone sold my fifth grader. 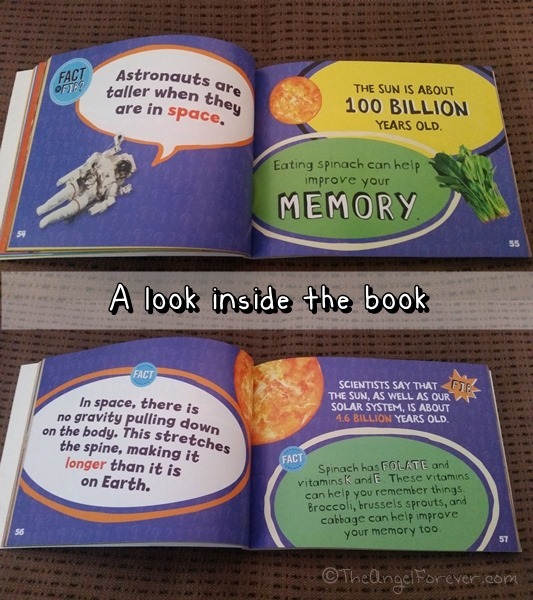 As a parent and teacher, I adore that a spark of learning can inspire kids to want to know more about the wide range of topics within the pages. I know these books will be traveling with us this summer. They are perfect for on the go and perfect for summer enrichment. The first book focuses on knowledge about dinosaurs, bugs, and animals. The second book tackles space, the human body (including passing gas), and technology. What books will your children be reading this summer to keep learning alive? As always, Tuesday Tales is all about sharing our love of books. Please let me know what you have read recently. Be sure to link up to your book posts in the comments below. Include something you read on your own, with a child, or someone else. Disclosure: As noted above, I received both of these books from Sterling Children’s Books and decided to review them because of the reaction from my children. No other compensation was received and all opinions are my own.